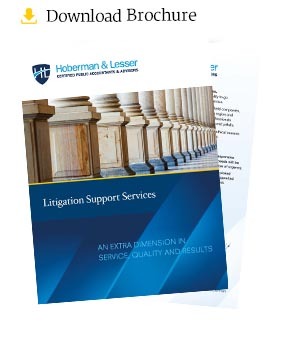 HL and our litigation support team have assisted in many litigation cases for lost profits and business damages. We have the ability to testify as an expert on numerous commercial damage issues. We have prepared business valuations for purchase acquisitions, sale price determination, estate and gift valuations, government acquisitions or condemnation purposes for either the business owner or government agency as well as shareholder disputes. HL professionals also have special expertise in the area of marital dissolutions. As divorce experts, our work involves equitable division of marital property, business and professional practice valuations, requesting appropriate documents for production, lifestyle analysis to determine the spending patterns of each party, income analysis, child support and alimony calculations, tax issues with regard to support, and property settlements. To learn more about how our proven expertise can help you safeguard your assets, contact Robert Hoberman at 212-463-0900 or e-mail robert@hobermanlesser.com.